The park bench in the photo is a memorable one. Behind the bench is the Danube canal. In front across the road, Schuttelstrasse, was the apartment building of a family friend I visited a few years ago. From the living room window, one can see the street that leads to Hundertvasserhaus. The unique apartment building was designed by Friedensriech Hundertvasser to counter anything ugly going up on its site. The building features undulating floors, roof with grass on top, trees inside the apartments, branches sticking out windows that do not match. 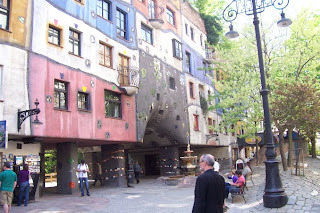 It is a cultural landmark, one of the most visited buildings in Vienna. From the kitchen windown of the apartment, on the other side of the apartment, is the city park that leads to the Prater. The year round amusement park features the world's largest wooden ferris wheel. 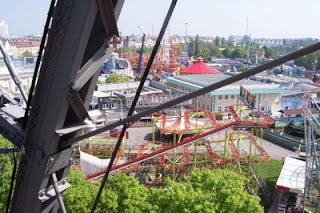 The view in the photo is from inside a carriage of the ferris wheel. 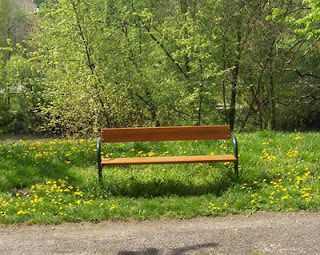 On September 11, 2001, at 3:00 pm I was sitting on this bench by the Danube canal. I was to meet Ruby, the family friend, at her apartment. Fifteen minutes later, I heard someone calling me from the bus stop on the other side of the road. It was Ruby and her assistant, saying something about an airplane that crashed into the World Trade Center. In the apartment, she turned on the tv. My first reaction was, "Ah, this is a tv movie!" As we listened to the reporters, another airplane came into view, like a mosquito coming closer to the other tower. I said, "It must be one of those news helicopters." Of course it wasn't. As we watched, we saw people jumping out of the windows. We wondered how people on the top floors were going to escape the raging inferno. Suddenly, the first building started to buckle and collapsed straight down. By then, Ruby was already in hysterics. I could only say, "This is so neat, so clean. How can that happen?" I was thinking a skyscraper like that wouldn't topple on account of fire. Then the next one came down the same way. That was how I learned about the tragedy of September 11, European time. I didn't read about the "conspiracy theory" until 2 years ago. I guess I had the same questions back then. It was nice to go down memory lane, one day during Easter week of this year. Ruby had moved since. Schuttelstrasse remains the same, a quiet street with the Danube canal in front and the city park to the Prater behind.